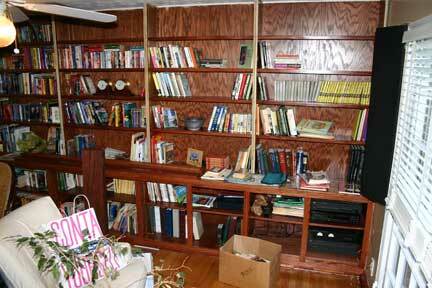 My wife has an extensive collection of books and has always wanted built-in shelving big enough to call a room a library. 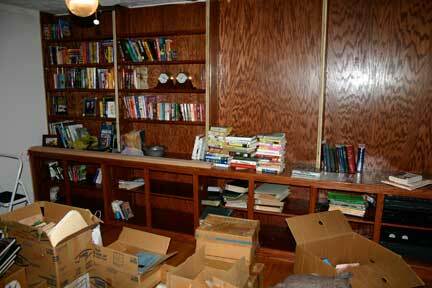 We have never been happy with shelving we have seen at stores, either pre-finished or unfinished. Good quality costs a lot, and you end up with a bunch of independent units that don't fill the wall particularly well. So, we undertook a project to build a wall of shelves in a spare main-floor bedroom. 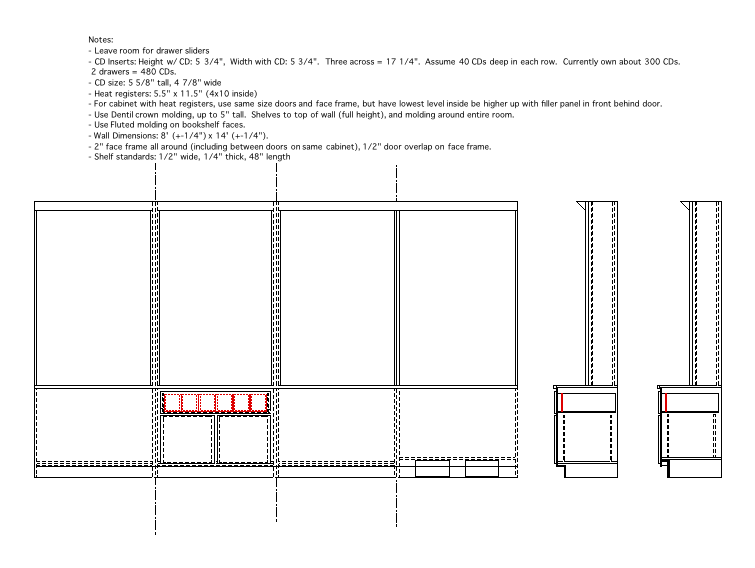 Rough plans for the shelves. Wall space was ~14' wide by ~8' tall. 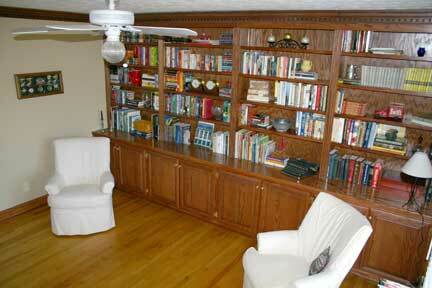 This divided up nicely into 4 units, with double doors on the bottom and open shelves on the tops. The unit on the far right had a slightly raised based for the bottom to accomodate a heat register in the floor. The initial plan was to have drawers in the tops of the cabinets as well to put CDs in, but this was nixed as it greatly cut into the storage space in the lower cabinets. The shelves were built in two halves then mated together. Shelf standards are solid brass with screw pins from Rockler. The primary carcas was made of 3/4" oak-faced plywood. 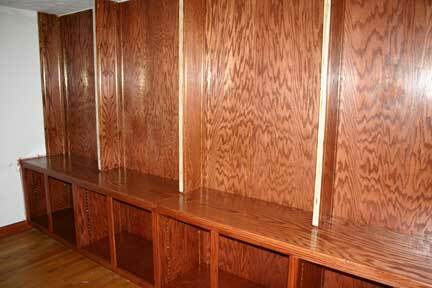 The backs were 1/4" oak-faced plywood. 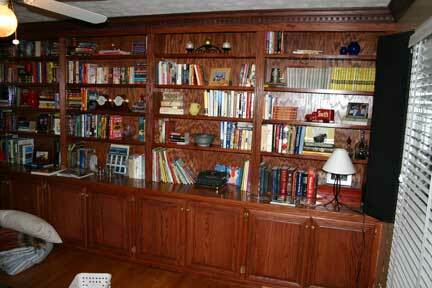 Shelves and cabinet top were 3/4" oak-faced plywood with a 3/4" solid-oak banding biscuit-joined to the front edge. 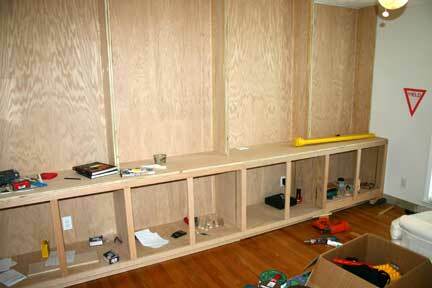 Both halves of the cabinets installed, with a solid-oak face frame on the lower cabinets. 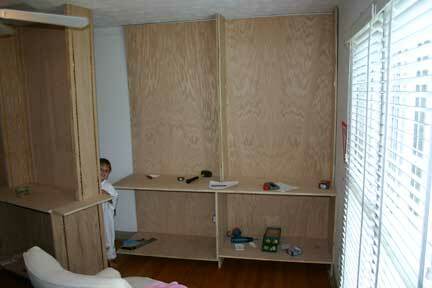 Cutouts were put into the backs of the lower cabinets to accomodate electrical outlets on the walls. The finish was a "custom" mix of oil-based stains. This made it very difficult to mix up additional batches and there were some color variations in later parts of the project. As soon as some of the shelves came in and the polyurethane had dried, my wife starting unpacking her books even before the rest of the mouldings and shelves were put on! Still unpacking. My wife graciously gave me two of the lower cabinets for stereo equipment and music. Finished project, with custom oak doors (from Rockler), a monster solid-oak dentil moulding that went all the way around the room, and fluted mouldings on the upper shelves. View to the other end of the room. 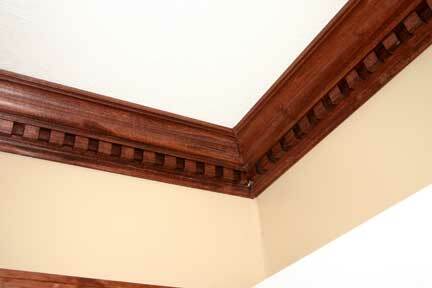 Closeup of the dentil crown moulding. Yes, those joints are coped.